What do you do, especially given the current infatuation with autochthonous varietals, if the only really exceptional red grape your region boasts is an unusual Moscato that yields tiny amounts of a fascinating sweet wine with a stunning bouquet? You can ask for advice, and one of the Valcalepio producers I talked with a few years ago told me that he did go to see Luigi Veronelli, the pioneering Italian food and wine writer who first recognized the importance of Sassicaia many years ago. Since Veronelli lived in Bergamo, and could look out in the direction of the Valcalepio production zone from the city's ramparts, asking him seemed like a good idea. "He said, 'Plant Nebbiolo!'" 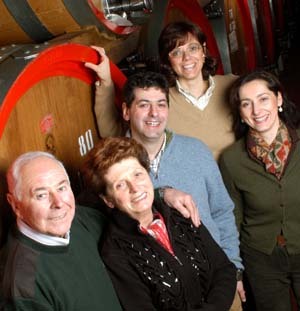 the producer told me, adding that, given the success the nearby Valtellina has with Nebbiolo, the advice seemed sound. He paused and shuddered: "The wine was horrible." The other option is to continue along the path forged by one's ancestors, who, faced with the same problem more than a century ago, decided to plant French varietals, in particular Cabernet and Merlot. Why go with the French? Because the French have been working to improve them for centuries -- they are, after all, the backbone of Bordeaux -- and in obtaining quality also obtained consistency. In other words, Cabernet and Merlot are much more likely to give good results in a new area than are the more finicky Italian varietals, say the above-mentioned Nebbiolo. And it was precisely this reasoning that led the Cantina Sociale Bergamasca, the local cooperative winery, to settle upon a Bordeaux-style Cabernet-Merlot blend for the red wine when they requested the recognition of the Valcalepio Appellation in the mid-70s. This was a time of dramatic change in the countryside around Bergamo: Industrialization was in full swing and the tenant farmers were abandoning the land they had farmed for generations in favor of newly created factory jobs; as a result the landowners, many of whom had no agricultural experience, found themselves forced either to roll up their sleeves and administer their estates directly, or to sell to others interested in taking up farming. Given the state of flux, it would have been quite easy for the different producers to go off on a variety of tangents, as it were, and had this happened the region could well have suffered the sort of agricultural collapse that swept though Chianti in the early 70s. Instead, the establishment of the new appellation, coupled with the support and advice provided by the Cantina Sociale, helped stabilize the agricultural economy and lay the foundations for its future development. * Valcalepio Rosso, which is 25-60% Cabernet Sauvignon, and the remainder Merlot; minimum alcohol content is 11.5%, minimum aging is a year, at least three months of which in wood, and maximum yield is 100 quintals/hectare. * Valcalepio Bianco, which is a blend of 55-80% Pinot Bianco and Chardonnay, with the remainder Pinot Grigio; minimum alcohol content is 11.5%, and maximum yield is 90 quintals/hectare. * Valcalepio Rosso Riserva, which is 25-60% Cabernet Sauvignon and the remainder Merlot; minimum alcohol content is 12.5%, minimum aging is 3 years, at least one of which in wood, and maximum yield is 100 quintals/hectare. * Valcalepio Moscato Passito, which is made from the Moscato di Scanzo grape; it has a minimum potential alcohol content of 17%, of which 15% must be effective, have a sugar content of 30-80 grams/liter, be aged at least 18 months, and a maximum yield of 6500 quintals/hectare, or 6000 if it's labeled Moscato di Scanzo, which can only be made in the township of Scanzo. "Well and good," I hear you say, "but why should I be interested in an obscure Bordeaux-Style blend from Italy?" Because both Cabernet and Merlot have adapted nicely to the hills around Bergamo, and the wines are pleasant, especially the Valcalepio Rosso, which tends to combine nice fruit with lively acidity that keeps the wine on its toes and makes it a good companion to meat-based pasta dishes, light stews, and grilled or roasted meats, including fattier cuts such as roast chicken with the skin or even ribs. Valcalepio Rosso Superiore is also interesting, though here I have some reservations; it is, as one would expect from the word Superiore, more powerful than the Valcalepio Base, but there isn't quite as much a unity of vision among the producers. Some simply worked to achieve greater concentration, depth, and finesse within the pattern established by the Valcalepio Base, and these wines I liked. Others instead bulked up their Valcalepio Superiore, combining considerable concentration with equally considerable small wood, and in doing so achieved heavy handed and rather lumbering results. Valcalepio Bianco can also be quite enjoyable, though to be frank, I found them to be less distinctive than the Valcalepio Rosso Base -- the international varietals used to grow them are perfectly happy in their new surroundings, but haven't really developed a local flavor. This for the official Valcalepio blend, which consists of Pinot Bianco, Chardonnay and Pinot Grigio. Bergamo does have some local varietals, however, and the Cantina Sociale Bergamasca is experimenting with an autochthonous white grape called Manzoni that favorably impressed me. I hope other producers will begin to experiment with it too -- they could find themselves with a good, distinctive wine to bring to market, and those are always nice to have. Finally, the passiti made from Moscato di Scanzo are extremely interesting, and if you like passiti you will want to seek them out. In short, the foothills behind the Bergamo are becoming a wine producing area. Much of the credit for this transformation is due to Count Grumelli Pedrocca Bonaventura, President of both the Cantina Sociale Bergamasca and the Consorzio Tutela Valcalepio, whose vision has guided the development of the Valcalepio Appellation. And to Sergio Cantoni, Director of the Consorzio, whose experience as an enologist has allowed him to help the winemakers improve the quality of their wines. And improve they have, since I first tasted through the region a few years ago. It's obvious that many winemakers are still getting a feel for their land, and I did encounter some wines that were technically deficient in the course of tasting this spring, but the average level has risen considerably, and I expect it to continue on this path in future years. Delicate ruby with pale pink rim. The bouquet is fairly rich, with cherry fruit supported by dusky shadowy accents and some vegetal greenishness, and also some fairly bright vegetal acidity. On the palate it's light, with clean fresh berry fruit supported by some sour berry fruit acidity and by smooth sweet tannins that flow into a clean slightly sour finish. A simple, direct wine that will work nicely with first course dishes, and also with simple grilled meats and similar. Deep cherry ruby with black reflections and cherry rim. The bouquet is fresh, with rather pungent berry fruit supported by greenish accents and some cedar. Still developoing, but pleasant to sniff. On the palate it's ample and soft, with rich fairly sweet jammy cherry fruit supported by delicate raspberry acidity and by a fair amount of warmth, while the tannins are very smooth and again sweet, almost sugary and flow into a delicate fairly sweet 8for a dry wine) berry fruit finish with some vanilla accents. Pleasant in a softer key, and will drink nicely with drier meats -- pork loin for example. It's quite ready now. Deep cherry ruby with black reflections and brilliant ruby highlights; the rim pales to white. The bouquet is powerful, with a fair amount of greenish cedar that does battle with greenish vegetal accents and red berry fruit, not quite winning, but certainly holding its own. A lot of oak, but nicely dosed and works well with the fruit. On the palate it's ample and quite smooth, with rich cherry fruit supported by some cedary accents and bright berry fruit acidity, while the tannins are pleasingly silky and flow into a fairly long berry fruit finish with some sweetish accents. Quite pleasant, and, because of the sweetness in the finish, will work well with succulent stews or roasts, including spicier dishes such as goulash. Worth seeking out. Note: I also tasted the 2001 vintage of this wine. Deep cherry ruby with black reflections and cherry rim. The bouquet is intense, and stil quite young, with red berry fruit supported by considerable warmth and some penetrating acidity, with underlying pencil shavings and spice. On the palate it's ample and quite smooth, with moderately intense berry fruit supported by smooth sweet tannins and moderate acidity. A more delicate expression, and it's a touch more settled than I might have liked. Deep black almandine ruby with black reflections and almandine rim. The bouquet is powerful, with rich prune laced berry fruit supported by greenish cedar and a fair amount of alcohol, mingled with dusky accents that bring dappled shade to mind. Quite a bit to say, and still quite young. On the palate it's ample, with rich prune cherry fruit supported by smooth sweet tannins that display slight pencil shaving bitterness, and by deft sour plum acidity that flows into a clean slightly sour berry fruit finish that's fairly long, settling into lasting warmth. Pleasant, and will work quite nicely with roasts or rich stews, from leg of lamb through stewed boar or venison. Worth seeking out. Elegant black almandine with black reflections and white rim. The bouquet is intense, with fairly sweet bef laced with cedar that balances the fruit, and some deft vegetal accents as well. Nice balance and harmonious. On the palate it's full and soft, with rich cherry fruit that gains direction from bright raspberry acidity, while the tannins are smooth and soft, with a slight vanilla underpinning, and flow into a clean fresh berry fruit finish that's fairly long. Pleasant, in a smooth soft (but not settled) key, and will drink well with roasts or stews. It also has the capacity to age well for another 5 years, though I found myself enjoying its freshness. Deep black almandine with black reflections and almandine rim. The bouquet is ample, with rich cherry prune fruit supported by cedar and hints of cumin and sandalwood with some underlying sweetness. Nice balance and depth, and elegant. On the palate it's ample and rich, with pleasant cherry plum fruit supported by bright sour berry fruit acidity -- not quite red currant but that directions and by sweet tannins that have a splintery burr and flow into a fairly long fruit laced finish with tannic underpinning. Graceful, and will drink nicely with grilled meats, including -- thanks to the acidity -- fattier things such as lamb chops, and also with hearty roasts or stews. It also has the capacity to age for another 5-8 years at least. Because of its acidity and the splinteriness of the tannins it's a wine I would pour with foods rather than drink by the glass. Deep black almandine ruby with black reflections and cherry rim. The bouquet is fresh, and still developing, but reveals dusky prune and berry fruit supported by some greenish accents and underbrush, with underlying fairly sweet cedar. Nice balance and depth, though it speaks quietly now -- one has to cup one's ear. On the palate it's ample, with rich cherry plum fruit that gains roundness from slight sweetness, and is supported by a combination of prune acidity, and by smooth tannins that have a dusky pencil saving bitterness to them, and flow into a clean fairly fruit laced finish that becomes drier as the tannins emerge with the fading of the fruit. It's a food wine, and will work quite well with succulent red meats, in particular roasts and stews. Fairly deep almandine with black reflections and almandine rim fading to orange. The bouquet is intense, and though not overripe has something about it that makes me think hot vintage; the fruit is sour berry fruit and it's supported by fairly intense leathery balsamic accents that also reveal some sage and mint as the wine opens, and fairly intense but not overly strong alcohol. Some petroleum too. On the palate it's ample and quite smooth, with ample sour cherry fruit supported by moderate acidity and by full very sweet tannins that flow into a clean slightly balsamic finish with some polished leather accents. It has held up very well, and is pleasant to drink, though it is the child of a hot vintage, and this comes out strongly on the palate in the softness of the acidity and the sweetness of the tannins. In terms of food wine pairings, I would go with drier meats. Deep black almandine with black reflections and almandine rim. The bouquet is mature, with some leaf tobacco and underbrush mingled with spice and some leathery acidity, also dried flowers and hints of wood smoke. Nice depth and pleasant in a mature key. On the palate it's ample, quite smooth, and still fresh, with rich cherry fruit supported by smooth sweet tannins and rather graceful berry fruit acidity that does have slight leathery overtones and flows into a clean fairly long sour berry fruit finish. Pleasant, and has held up very well; it's not at all tired, and should you have a bottle it will drink nicely with hearty foods; I might be tempted to pair it with a rich stew with polenta. Deep black almandine with black reflections and almandine rim. The bouquet is fairly intense, with leathery berry fruit laced with leaf tobacco and spice with some cedar as well, and some sweetish jammy accents. Nice depth, and quite alive. On the palate it's ample, with rich plum prune fruit supported by moderately intense acidity and by smooth sweet tannins that have some sweet balsamic accents and flow into a clean fairly sweet prune laced finish with lasting warmth and some tannic underpinning. Pleasant, and quite alive; the tannins do have a touch of splinter to them and I would therefore serve it more with foods than by the glass, and likely serve it with a stew and polenta. I have always enjoyed Carpenè Malvolti's wines, and make a point of stopping at their stand during Vinitaly to taste both their Prosecco and their Arte della Spumantistica wines, wines made form other grapes (and from other regions) that are quite interesting and quite enjoyable. Pale brassy white with intense perlage. The bouquet is clean and fresh with cut green apples and some spice; it's quite rich and is also inviting. On the palate it's ample and soft, with rich granny smith apple fruit supported by crisp apple sweetness and deft granny smith acidity that flows into a clean bright apple finish. Pleasant and extremely approachable; it will be quite nice as an aperitif, especially with sweeter antipasti, and also to drink at poolside in the hot summer months. Expect it to go quickly, and you may need a second bottle. Pale brassy white with brilliant brassy reflections and fine intense perlage. The bouquet is fairly rich, with apple fruit laced with some minerality and delicate slightly sugary apples, granny smith in particular, and by airy spice. On the palate it's ample and soft, with fairly rich slightly bruised apple fruit supported by warm Delicious apple acidity and by the sparkle, which confers a creamy texture, and flows into a warm apple laced finish. Pleasant, and displays nice depth; if you like sparkling wines but don't like the brash aggressiveness that a Pinot-Noir based champagne can have, it is a good alternative, and will work well as an aperitif or with foods. Pale salmon with fine perlage. The bouquet is moderately intense with slightly smoky red berry fruit supported by airiness and a degree of minerality as well, and airiness. On the palate it's fairly rich, with clean fairly bright red berry fruit supported by fairly bright acidity and by slight smooth sweet tannins that flow into a clean rather mineral finish with bitter underpinning. It's a pleasant rosé that will drink nicely as an aperitif, and will also work well with creamy fish or meat based risotti, and will also work well with simple creamy white meats or fish. In short, versatile. Pale brassy gold with brilliant brassy reflections and fine perlage. The bouquet is fresh, with pleasant floral accents mingled with white berry fruit and some sweetish accents. Quite nice to sniff. On the palate it's ample and soft and fairly sweet, with rich creamy white berry fruit supported by moderately intense sour loquat acidity and sparkle, which flow into a clean bright finish that gains sour accents as the fruit and sparkle fade. Quite pleasant, and will drink nicely as an aperitif, and might, because of its relative sweetness, be a nice bet with oriental dishes, ranging from moderately intense Chinese through Sushi. Pale almost papery brassy white with brilliant greenish brassy reflections and fine insistent perlage. The bouquet is rich, with intriguing floral accents supported by graceful spice, mint and herbal sage, and some savory notes. Quite pleasant to sniff. On the palate it's ample and soft, with fairly rich white berry fruit supported by creamy sparkle and some sweetness, which flow into a clean fresh slightly bitter white berry fruit finish in which savory notes provide a pleasant counterpoint. Very nice, and will work beautifully as an aperitif or at table, with egg or cheese based dishes, and also with creamy fish based pasta sauces; it will also be nice with grilled fish, including crustaceans. It's quite nice, and well worth seeking out unless you only look for the bracing acidity that Pinot Noir-based sparkling wines often have. Pale brassy white with brassy reflections and fine perlage. The bouquet is pleasant, with slightly pickled lemony fruit supported by some gunflint and spice, and by some vegetal accents. Pleasing complexity. On the palate it's ample and smooth with fairly rich, fairly sweet white berry fruit that has some sour citric overtones supported by creamy sparkle and by smooth creamy acidity that flow into a fairly long finish that acquitted bitter accents as the fruit fades. Quite nice as an aperitif, and will also drink well with creamy dishes, ranging from risotti through creamy meats and fish. This takes the place of Promotico, which was (I think) the weakest of the Arte Spumantistica wines. It's pale brassy white with brassy reflections and fine long lasting perlage. The bouquet is rich, with fairly intense gooseberry mingled with sweaty blonde and supported by some greenish accents. Nice depth and balance. On the palate it's ample and soft, with fairly rich citric fruit that gains creaminess from the sparkle and flows into a clean finish in which the gooseberry accents present on the nose emerge once more. Pleasant, in an extremely approachable key, and will work nicely as an aperitif or with grilled fish, and I might be tempted to serve it at a cookout too, which would be overkill but nice. A very welcome addition to the line. This is a demi-sec blend of Glera (a new name for the Prosecco varietal, to distinguish the wine from the grape) and Moscato. It's pale brassy white with brassy reflections and fine intense perlage. The bouquet is fairly intense, and rather sweet with sugary white berry fruit supported by some dusky accents and spice that gives an impression of sweetness. On the palate it's ample and quite sweet, with fairly rich honey-laced white berry fruit; by comparison with a moscato it's not quite as rich and the fruit is a bit more citric, and it flows into a clean fresh sweet slightly greenish white berry fruit finish. Pleasant and will work nicely at the close of a meal or at pool side, or perhaps in the evening on a terrace as the shadows darken and the stars come out. Brilliant brassy gold with greenish reflections and fine intense perlage. The bouquet is intense slightly greenish accents mingled with bread crumbs and some sour accents that provide depth, and some gunflint as well. On the palate it's fairly rich, with clean bright berry fruit supported by greenish accents and creminess from the sparkle, which lead into a clean fairly rich slightly greenish finish. Pleasant, and will work nicely as an aperitif or with foods; it's a bit less acidic than many Champagnes or other wines made from Pinot Noir, and this makes it slightly more approachable, as does its slightly greater sweetness, especially if you don't like bone dry aggressive sparkling wines. This year Tedeschi did things a little differently, presenting, in addition to the current releases, a number of older vintages to underline the aging capacity of their wines. I began with them, and then worked through their more recent vintages. It was a very pleasant hour. Deep black almandine with black reflections and almandine rim. The bouquet is elegant, with rich berry fruit laced with some underbrush and wet leaves, and also pleasing spice with some balsamic accents and leaf tobacco. Nice balance and considerable depth in a rather dusky key. On the palate it's full, round, and quite smooth, with powerful cherry plum fruit supported by lively sour berry fruit acidity and by smooth sweet tannins that flow into a long warm finish. One wouldn't guess it is close to 10 years old. A child, no longer a babe, with along future. Deep black cherry ruby with black reflections and almandine rim. The bouquet is rich, with jammy berry fruit laced with balsamic accents and some spice; it is clearly from a hotter vintage (August 2000 was as hot as 2003) but is nicely balanced and quite rich. On the palate it's ample and rich, with powerful jammy fruit supported by lively acidity than is brighter than I expected given the heat of august 2000, and by smooth sweet tannins that flow into a clean bright berry fruit finish. Quite pleasant and has a lot to say and share in a slightly more aggressive key, and this is an effect of the heat; while it is quite ready to drink it also has the legs to age well for another decade or more. It's more skittish than the 2001, because of the heat, which affected the ripening of the tannins, and because of this skittishness is a tad more interesting. Deep pigeon blood ruby with black reflections and almandine rim; The bouquet is elegant, with rich berry fruit supported by some brown sugar sweetness, and by dusky leaf tobacco and spice. Quick to write, but quite harmonious and very pleasant to sniff. On the palate it's ample and quite smooth, with rich sandalwood laced cherry fruit that has some jammy accents and considerable warmth, and is supported by a combination of deft berry fruit acidity and very smooth sweet tobacco laced tannins that flow into a long warm finish with balsamic berry fruit that has some brown sugar sweetness and tobacco mixed into it. Very nice, and beautiful proof of the aging capacity of the wines from Verona, as if there were any need. Deep almandine laced brownish ruby with black reflections and almandine rim. Beginning to show its age. The bouquet is elegant, with rich berry fruit supported by candied accents and brown sugar, and sweet balasamic notes as well, with some spice, in particular cracked black pepper, and alcohol too. Quite elegant, and has a great lot to say; it's one of those wines one can swish and sniff, and swish and sniff without feeling the need to sip. But tasters must, and on the palate it's ample, with rich dusky cherry fruit supported by moderate acidity and sandalwood, and by tannins that are quite smooth and have warm balsamic accents and flow into a clean balsam laced finish that is quite long. Very pleasant, and will drink quite well with roasts or grilled meats, and also has a long ways left to age, though if you let it age further you should be a lover of aged, as opposed to young wines. This was made with a small percentage of Cabernet, hence the IGT designation (now the Cabernet is gone, and it's a Valpolicella Superiore). Deep pigeon blood ruby with some garnet accents and almandine in the rim. The bouquet is powerful and spicy, with sandalwood and berry fruit mingled with cedar; the Cabernet adds to the richness but doesn't stand out. A great lot going on in a rich spicy, slightly exotic key, and quite interesting. On the palate it's ample and rich with spicy berry fruit supported by clean sweet tannins that have a slight burr, and flow into a clean spicy almost mentholated finish with lasting warmth. Elegant anf quite interesting; the tannins impart a slight dryness that would lead me to drink it with foods rather than far fdrom the table, and with a rich stew it would be about perfect. Lively cherry ruby with black reflections and cherry rim. The bouquet is fresh and vinous with lively floral accents and rich berry fruit supported by strawberry and sandalwood mingled with cherry fruit. Youth in a glass. On the palate it's rich and fresh, with lively berry fruit supported by bright berry fruit acidity and by tannins that have a dusky burr and flow into a fairly long berry fruit finish. A light lark of a wine, which will work nicely with simple grilled meats, or light stews, and will also be a nice accompaniment to meat based pasta dishes or cookouts. In short, versatile, and it will go quite fast. What a basic Valpolicella should be. Worth seeking out. Deep pigeon blood ruby with cherry rim. The bouquet is rich, with sandalwood laced berry fruit supported by greenish accents and considerable white pepper spice. Pleasant in a very young key, and though it clearly will develop, it's inviting now. On the palate it's ample and quite smooth, with rich sandalwood laced berry fruit supported by deft brambly acidity and tannins that have a slight greenish burr and flow into a clean greenish berry fruit finish. Quite pleasant, and though it will develop with time I would almost be tempted to drink it now with a steak, overtones enjoy its freshness. Very nice. Elegant ruby with black reflections and black rim. The bouquet is still developing, but displays warmth and spice mingled with berry fruit and a fair amount of alcohol. It's coming together, but needs another year to get its bearings. On the palate it's full and rich, with powerful cherry plum fruit supported by greenish acidity and by smooth sweet tannins that have a slight Valpolicella greenish burr, and flow into a clean berry fruit finish with bitter accents. It needs at least a year and would be happier with two or more; quite nice and worth seeking out, but do give it some time. Elegant black cherry ruby with black reflections and cherry rim. The bouquet is intense and very young, revealing berry fruit mingled with spice, in particular cumin seed that opens to reveal bell pepper vegetal accents, and a fair amount of alcohol. Not quite a work in progress, but close. On the palate it's ample and rich, with powerful berry fruit supported by greenish bell peppers and pepper acidity supported by dusky spice and acidity, and by tannins that have a warm burr and flow into a clean sour berry fruit finish. Quite elegant, but needs time; it will likely become a meditation wine in years overtones come, but will work well in the near future with rich stews or roasts, and Verona's bollito misto also comes to mind..
Impenetrable pyrope with black reflections and cherry rim paling to almandine. The bouquet is intense and very young, with cherry fruit supported by licorice root and peppery spice with some sandalwood and also hints of scalded milk -- it's still coming together and needs time. On the palate it's full, and rich, and farly sweet, with lively sandalwood laced berry fruit supported by sweet jammy accents and peppery spice, while the tannins are peppery with some sandalwood and licorice root overtones, and flow into a long fairly sweet finish. Quite charged, and an abundance of power that is still working hard to figure out what to do with itself. It's very much in the air, but will clean up nicely in a fairly sweet (for an Amarone) key and work well with rich stews or roasts. In short, it has a ways to go, and I wouldn't think of opening it before 2013. Impenetrable black lam with black reflections and almandine rim. The bouquet is rich, with elegant berry fruit supported by clean rather pungent underbrush and considerable sandalwood spice, and also by deft warmth; it's quick to write and very young but also very pleasant, and quite rich in a cooler vintage key in which the fruit is rich but not as ripe as it was in the 2006 vintage. On the palate it's full and rich, with powerful cherry plum fruit supported by clean fresh plum cherry acidity and by considerable peppery spice, while the tannins are sweet, but still quite young, and need another couple of years to develop, at which point they will be drinkable but at the beginning of a long climb. It will have a lot overtones say -- does already -- but really isn't ready yet, and I would give it 3-5 years to come together and expect it to age well for a decade or more. A very fine expression of a cooler vintage Amarone. Deep pyrope ruby with purple reflections and cherry rim. It's younger looking in terms of color register than the 2005, and this is the vintage as much as the wine. The bouquet is intense, with greenish accents and berry fruit supported by sandalwood and a fair amount of alcohol; by comparison with the 05 there is more fruit and less spice, and Sabrina says this is the direction they are taking; I can't but agree. On the palate it's ample and smooth, with rich fairly sweet prune and berry plum fruit supported by sweetness and clean sweet tannins that flow into a clean savory finish. Quite pleasant, and I do like the return to more fruit and less spice, which is how I remember Tedeschi's wines in the past, though it needs time. 2-3 years at least, and 5 wouldn't be amiss; it will also age quite well for a decade or more beyond the current 5. Impenetrable pyrope with deep cherry ruby rim. Poured ink. The bouquet is powerful and quite sweet with jammy prune cherry fruit supported by pleasing sandalwood spice and dusky warmth; it's quite harmonious and one could write at length without getting much further than providing more descriptors. In short, it offers a lot to think about. On the palate it's ample with rich prune cherry fruit supported by deft greenish sandalwood acidity and by smooth sweet tannins that flow into a fairly long clean prune finish. A beautiful wine that will work very well with cheeses, though its true place is with like minded friends, far from the distractions of the table. Elisabetta Fagiuoli says an Amarone is a bad Recioto, and when faced with a wine like this one realizes she's right. Impenetrable pyrope with black reflections and cherry rim. The bouquet is still developing, but reveals prune and cherry fruit supported by dusky greenish sandalwood spice and some tart accents. Very fine. On the palate it's richer and fresher than the 2005, with more languid cherry prune fruit supported by smooth sweet tannins and deft sandalwood acidity that flow into a long clean fresh finish that at present is a little dry thanks to the youth of the tannins. But it is promising, a beautiful wine that will have a great deal to say when it has come together. This is from white grapes and is elegant tawny apricot with brilliant apricot reflections and slight greenish highlights towards the rim. The bouquet is intense, and quite sweet, with greenish notes typical of Garganega and also with petroleum and spice, and bitter honey. On the palate it's ample and languid, with rich white berry fruit supported by clean bright acidity and by smooth sweetness and languid glycerin that flow into a clean fairly rich finish that carries a degree of acidity, and is thus very much alive.. Very nice, and will work beautifully at the close of the meal, when people have left the table and adjourned to the sitting room. Cantele Alticelli Fiano Salento IGT 2009 Pale brassy white wirth brassy reflections and white rim. The bouquet is fresh, with clean heather and some candied tropical fruit. Hot vintage key. On the palate it's ample and rather languid, with clean bright tropical fruit, a mixture of mango and some pineapple acidity supported by pineapple acidity that flows into a clean bright finish Pleasant and will be a nice aperitif or with simple fish dishes. Cantele Negroamaro Rosato Salento IGT 2009 Lively rose with brilliant reflections and white rim. The bouquet is moderately intense with berry fruit and some almonds and spice. Still coming together. On the palate it's bright, with clean berry fruit supported by fairly bright acidity and by slightly languid light tannins that flow into a clean bright finish. A pleasant, direct Rosato that will be nice at a cookout or with simple grilled fish or meats. Cantele Negroamaro Salento IGT 2008 Deep brick ruby with black reflections and white rim. The bouquet is po9werful, with considerable spice mingled with sandalwood and red berry fruit. Fairly aggressive. On the palate it's light, with clean bright berry fruit supported by deft berry fruit acidity and by smooth sweet tannins that flow into a clean sour slightly bitter finish with some underbrush accents and leathery tannins. Pleasant, and is a fine food wine that will work well with grilled meats or light stews. Expect it to go quickly. Cantele Salice Salentino DOC Riserva 2007 This is 85-15 Negoramaro-Malvasia Nera blend, and of the 24 months of required aging prior to release, 6 are spent in barriques. Deep cherry ruby with dusky almandine in the rim. The bouquet is elegant, with berry fruit mingled with sandalwood spice and some cedar, and also brambly acidity. Nice balance, and very young. On the palate it's medium bodied, with bright berry fruit supported by clean brambly acidity and tannins that are a bit splintery, and flow into a clean rather brambly finish. It's not a wine to drink by the glass far from the table, but will work very well with foods, especially simple grilled meats and light stews, and will also be nice with traditional Puglian vegetarian foods, for example fava bean puree with refried greens. Quite versatile, in a food pairing key. Will also age nicely, becoming silky with time. Canteli Alticelli IGT Puglia 2007 This is an Aglianico: Deep brick ruby with black reflections and cherry rim. The bouquet is rich, with clean prune cherry fruit supported by leather and pronounced underbrush and also some spice. Pleasant to sniff. On the palate it's ample, with bright sour berry fruit supported by leathery tannins and clean mineral acidity that flow into a fairly bright tannic finish with mineral accents and some bitterness. Quite pleasant and will drink well with succulent red meats or light stews, and also will work well with grilled meats. I would expect it to age wel for 5-8 years. Worth seeking out. Cantele Teresa Manara IGT Salento 2007 This is a Negroamaro from vineyards pruned in the traditional Alberello, or shrub style. Deep almandine with black reflections and almandine rim. The bouquet is still very young, but reveals some berry fruit supported by sandalwood and spice. A work in progress. On the palate it's full and rich, with elegant slightly sour cherry fruit supported by sandalwood spice and warmth, and by clean berry fruit acidity while the tannins are smooth and sweet, with slight sandalwood accents. Very nice, and when the nose catches up to the palate (a year at least) it will be impressive. And will age well for a decade or more. Worth seeking out to set aside. Cantele Amativo Salento IGT 2007 This is a blend of 60% Primitivo and 40% Negroamaro; it's deep black cherry ruby with black reflections and cherry rim. The bouquet is still quite young, with an initial rush of cedar mingled with berry fruit and some acidity. Needs time. On the palate it's full and rich, with powerful red berry fruit supported by berry fruit acidity and smooth sweet tannins that flow into a clean slightly sour berry fruit finish. A nice blend of the two varietals, with Negroamaro conferring acidity and brightness, while the Primitivo confers a rich very pleasant roundness. While both are capable of reaching great heights, the sum is also capable of being greater than the parts, and the wine is extremely pleasant. It will also work very well at table, with grilled meats including fattier cuts such as ribs, or with hearty roasts. It's very young, and needs time, but will work well with foods even now, and will also go quickly at table despite being a substantial wine. The score reflects the present. Last thing: Cantele has a fine blog with much more than wine, and if you read Italian you should check it out. Even if you don't, the pictures are pretty. As I said in introducing Bardolino Chiaretto, Verona has managed the difficult trick of boasting two great red wines made from the same grapes that are totally different: Valpolicella and Bardolino. Bardolino, which is produced in the lower hills to the west of Valpolicella, along the shore of Lake Garda, is a lighter, livelier wine than its cousin, and is one of the classic Italian quaffing wines. 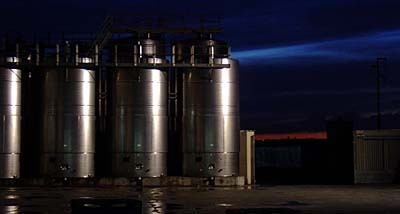 In terms of numbers, Bardolino is a serious wine: about 20 million bottles were produced in 2009. The primary grapes are Corvina Veronese and Rondinella, while the terrains the roughly 3,000 hectares of vineyards are planted on are primarily of glacial origin -- moraines of one kind or another, which vary from place to place but confer a universal freshness and drinkability. It was difficult, with a very hot July that drove up alcohol levels by increasing sugar content, and in some areas interfered wit phenolic ripening because it brought drought stress. In this respect it resembled 2003, and we were told that the winemakers who delayed the harvest were wise in hindsight, because there were fall rains that conferred acidity to the grapes. Last week I gave my impressions of the 2009 Bardolino Chiaretto, and Bardolino Chiaretto Spumante. Here we have my impressions of the 2009 Bardolino, tasted March 7 2010. Pale slightly orange ruby with some yellow in the rim. The bouquet is spicy, with greenish accents and graphite bitterness more than fruit at present; it's very young and still coming together. On the palate it's ample with moderate sour cherry fruit supported by greenish accents and bitter tannins more than acidity; the tannins flow into a clean rather bitter finish with a marked tannic burr that is also fairly warm. A good wine for cookouts or other occasions with quickly cooked, zestily flavorful meat dishes; though Carne alla pizzaiola is Neapolitan, it would work well here. Pale ruby with black reflections and white rim. The bouquet is deft, with brambly berry fruit supported by some graphite shavings and spice, with traces of heat as well. On the palate it's medium bodied, and rather angry, with graphite shaving bitterness more than fruit and quite a bit of sea salt, while the tannins are, well the Italian word would be ruvido, which means coarse or rough. It's an angry wine that won't work well with genteel foods, but will be nice with succulent grilled meats, for example spare ribs and sausages. Pale cherry ruby with brilliant ruby reflections and rosy rim fading to white. The bouquet is bright and fresh, with violets and cherry fruit supported by slight greenish acidity. Cheeky. On the palate it's medium bodied, with bright cherry fruit supported by clean bright berry fruit acidity and tannins that have a dusky burr and flow into a clean bright berry fruit finish. Pleasant, and will drink quite well with hearty vegetable soups, grilled meats and other quickly cooked foods. Pale ruby with brilliant ruby reflections and white rim. The bouquet is moderately intense, with berry fruit supported by some spice and slight peppery accents. On the palate it's medium bodied, with fairly rich sour cherry fruit supported by clean sour berry fruit acidity, and by tannins that have a slight burr and flow into a clean bright fruit laced tannic finish. Direct, in a wide-eyed way, and very easy to drink; it will go quickly with foods, which is what we want. Pigeon blood ruby with ruby reflections and cherry rim. The bouquet is fairly rich, with slightly sour cherry fruit laced with hints of eucalyptus and slight vegetal accents. Fresh. On the palate it's more languid than I expected, with moderately intense berry fruit supported by slight sweetness and by tannins that are very smooth, and though they do have a slight peppery burr that emerges in the finish. It's softer, and gives an impression of being from a hotter vintage; it will work for you if you like smooth soft wines with low acidities, but you have to like that style. Because of its characteristics, it's best suited to drier meats, or perhaps by the glass. Pale ruby with brilliant ruby reflectioins and white rim. The bouquet is fresh, with cherry and red plum fruit mingled with some spice and vinous warmth; it's still developing. On the palate it's bright, with lively berry fruit supported by brisk acidity and by tannins that have a rather rugged burr and flow into a fairly long warm sour berry fruit and tannin finish. Pleasant, in a direct and saucy way, and will be perfect at a cookout, and also work well with legume based dishes (Tuscany's fagioli all'uccelletto come to mind) and other foods that want a wine that is zesty. Pale ruby with slightly orange rim paling to white. The bouquet is fairly rich, with slightly candied cherries mingled with sandalwood and some rather greenish accents. On the palate it's ample, with moderate generic berry fruit supported by mineral acidity that's a bit retiring, and by tannins that have a bitter graphite burr and flow into a rather bitter finish. I'd have liked brighter fruit; it's a bit heatstruck. Deep pigeon blood ruby with black reflections and cherry rim. The bouquet is moderately intense, with fairly bright vinous accents mingled with tart acidity and some sour berry fruit overtones that increase in intensity as it opens, and also reveal some sandalwood. On the palate it's medium bodied, with ample sour berry fruit supported by moderate slightly greenish berry fruit acidity, and by tannins that have a savory burr and flow into a rather bitter berry fruit finish with a ruvid tannic underpinning. It's approachable, in a rather dusky brooding key, and will work nicely with succulent grilled meats, for example ribs or chicken with the skin. Ruby with black reflections and pink rim paling to white. The bouquet is fresh, in a rather swank and seductive sweetish cherry fruit key; there's berry fruit and there's jam, and the impression is luscious. On the palate it's not so soft; there's fairly rich cherry and forest berry fruit supported by moderate acidity and by tannins that have a hot burr and flow into a distinctly bitter tannic finish with a cherry plum underpinning. It will smooth some over the next few months, but the bitterness will remain, and make it a much better candidate to accompany succulent grilled meats or fried meats and vegetables than to be served by the glass. In short, a zesty food wine. Pale ruby with black reflections and some orange towards the rim. The bouquet is very young, and rather sour, with sour berry fruit supported by acidity and slight greenish accents. On the palate it's bright, with rich cherry fruit supported by lively cherry and forest berry fruit acidity, and by tannins that are bright, and have a slight youthful burr. Pleasant, and will drink very well with meat-based pasta dishes, light stews, and grilled meats. An ideal cookout wine, and you will want a second bottle. Worth seeking out. Elegant pigeon blood ruby with ruby reflections and pink rim. The bouquet is fresh, with pleasing floral accents mingled with some sandalwood and pleasant underlying spice. On the palate it's fairly bright, with cherry and forest berry fruit supported by bitterness and mineral acidity, and by light tannins that have a slight savory bitter burr and flow into a clean moderately long tannic finish. Pleasant, and will clean up nicely, drinking well with simple grilled meats or light stews. Ruby with black reflections and cherry rim. The bouquet is delicate, with jammy cherry plum fruit supported by some greenish spice and slight hints of eucalyptus. On the palate it's medium bodied and quite smooth, with cherry plum fruit supported by greenish sandalwood bitterness from grape, and by moderate acidity, while the tannins have a slight burr, and it all flows into a fairly long greenish vanish with a tannic and alcoholic underpinning. Pleasant, in a slightly hotter weather key than some -- these vineyards may have felt the July heat more -- and also in a slightly more exotic key, thanks overtones the sandalwood, which can appear in Verona's grapes; it will work well with grilled meats or light stews, and also with red sauced pasta dishes. Deep cherry ruby with black highlights and ruby reflections. The bouquet is fairly rich, with greenish berry fruit laced with sandal and slight eucalyptus, also some peppery spice. On the palate it's bright, with lively cherry fruit supported by bright cherry acidity and by tannins that are rather splintery, and spicy, and need time. On the other hand it is a barrel sample; in the space of a few months it will be quite pleasant in a cheeky rather challenging way, and drink well with grilled meats and all the other fixings of a cookout, or -- for that matter -- of a meat-based summer meal. Pale slightly almandine ruby with brilliant ruby reflections and white rim. The bouquet is muted, though more swishing does bring up vinous accents. It's still developing. On the palate it's fairly rich, with bright sour cherry fruit supported by clean sour berry fruit acidity and by tannins that have a moderately intense burr and flow into a clean sour berry fruit finish. It's pleasant, in a bright rather saucy key, and will also be quite versatile, drinking with all sorts of things, from pasta dishes to grilled meats and light stews. Worth seeking out. Cherry ruby with black reflections and cherry rim. The bouquet is muted, though swishing brings up smoky rather bitter berry fruit that gives an impression of heat. On the palate it's medium bodied, with moderately intense berry fruit supported by warmth and acidity, and by tannins that have a warm splintery burr and flow into a fairly long warm finish. It's quite aggressive, and also a bit heat struck, and because of its aggressiveness isn't for everyone. If you like the style it will work well with fattier grilled meats, and also with fried meats and vegetables. Lively black cherry ruby with ruby reflections and cherry rim paling to white. The bouquet is muted, though swishing brings up some berry fruit with delicate sour accents. It's like a person hiding behind a screen. On the palate it's medium bodied with moderately intense berry fruit supported by sour berry fruit acidity and by fairly smooth tannins that flow into a clean rather dour finish. Quite direct, and will drink well with simple grilled meats or light stews. Pale ruby with lively ruby reflections and white rim. The bouquet is moderately intense, with red berry fruit supported by some greenish accents and spice, and some jammy undertones. On the palate it's fairly rich, with bright jammy berry fruit supported by moderate acidity and by smooth fairly sweet tannins that do display a slight burr, and flow into a c élan rather sour cherry finish. Pleasant, in a softer fruit driven key, and quite versatile in a cheeky way; it will drink well with quickly cooked meats or light stews, and will also be nice with hearty pasta dishes, including stuffed pasta dishes. Pale ruby with black reflections and white rim. The bouquet is fairly intense, with dusky cherry fruit supported by some spice and savory bitter accents. On the palate it's ample and rather soft, with moderately intense sour cherry fruit supported by moderately intense citric acidity and by tannins that have a greenish burr and flow into a fairly bright bitter finish. It's aggressive, and will drink well with grilled meats or light stews; if you prefer smoother softer wines it won't work as well for you. Black cherry ruby with black reflections and white rim. The bouquet is muted, though swishing brings up some berry fruit mingled with delicate greenish accents, sandalwood, and some spice. It needs a few months. On the palate it's medium bodied, with moderately intense cherry fruit supported by soft acidic warmth, and by tannins that are smooth and have hints of cocoa to them, and flow into a clean tart berry fruit finish. Pleasant in a slightly lesser key, and though there is the aggressiveness of the vintage, it also is fairly graceful, in a willowy sort of way. It will work well with succulent grilled meats or light stews. Slightly orange ruby with black reflections and white rim. The bouquet is airy, with jammy berry fruit supported by sandalwood and spice; the overall impression is lacy somehow. On the palate it's rich, with fairly sweet jammy berry fruit supported by bright vegetal berry fruit acidity and by tannins that have a savory slightly greenish burr and flow into a clean sour cherry finish with vegetal tannic underpinning. Quite approachable, and will drink well with grilled meats or light stews, and though it does have the capacity to age nicely for a few years I would drink it now to enjoy its freshness. Lively ruby with black reflections and ruby rim paling to white. The bouquet is delicate, with floral accents and slightly sour berry fruit that has some jammy accents as well. On the palate it's bright, with slightly greenish berry fruit supported by vegetal acidity and tannins that have a greenish sandalwood underpinning and flow into a clean bright greenish berry fruit finish. It's fairly aggressive, in a greenish vegetal key, and if you prefer smoother softer wines it won't work as well for you. But if you like the style it will be nice at a cookout. Cherry ruby with black reflections and cherry rim. The bouquet is delicate, with jammy cherry fruit laced floral accents and some greenish sandalwood. Nice balance. On the palate it's ample and soft, with fairly rich cherry fruit supported by moderate mineral acidity and by tannins that have a greenish burr and flow into a clean slightly greenish finish. Pleasant, and though it is from a hot weather vintage it displays a pleasing grace, and will work quite well with simple grilled meats or light stews, and also has the acidity and tannic brightness necessary to work well with fried meats and vegetables. Lively ruby with black reflections. the bouquet is muted, though swishing brings up some savory accents and slight alcohol. On the palate it's ample, and softer than I expecte, with jammy berry fruit supported by very moderate warm sour berry fruit acidity, and by smooth sweet tannins that flow into a warm finish. It's a bit settled, and I would have liked more acidity to brighten it. Instead, it's relaxed. Almandine ruby with lively ruby reflections and white rim. The bouquet is muted. Shut tight. On the palate it's ample and soft, with moderate fruit supported by dusky bitterness and some mineral acidity, while the tannins are very smooth. It's settled in youth, and I found myself wanting more. Black cherry ruby with black reflections and ruby highlights, and a white rim. The bouquet is developing, but displays some fairly bright berry fruit laced with hints of sandalwood and warmth. On the palate it's bright, with rich cherry fruit that gains definition from greenish berry fruit acidity and is supported by rather aggressive tannins that have a greenish sandalwood burr and flow into a fairly long warm finish. If you like the style, which is fairly aggressive, you will enjoy it; it will work well with fattier grilled meats and vegetables, and also is brash enough to work well with fried foods. Almandine with black reflections and white rim. The bouquet is moderately intense and still coming together, with metallic accents mingled with berry fruit and some spice. On the palate it's bright, with lively cherry fruit supported by brisk citric acidity and by tannins that have a warm slightly savory burr and flow into a clean bright tannic finish. Pleasant in an aggressive key, or will be when the nose catches up with the palate, and will be perfect at a cookout or with quickly cooked summer foods. If you like the style, expect it to go quickly. Lively almandine with black reflections and cherry ruby rim paling to white. The bouquet is fairly rich, and coming together, with red berry fruit mingled with some wood smoke and some greenish accents. On the palate it's ample, and fairly soft, with rich jammy berry fruit supported by moderately intense sour cherry acidity and by tannins that are fairly smooth, though they do have a slight sandalwood burr, and flow into a clean bright slightly sour cherry finish. Pleasant, and quite approachable; it will drink well with grilled meats or light stews, and is also a wine I would be happy to serve with hearty pasta dishes, or even legume based soups. Worth seeking out. Pale almandine with lively ruby reflections and rim fading from pink to white. The bouquet is muted, though swishing brings up some berry fruit and slight jammy accents. On the palate it's fairly bright, with sour berry fruit supported by considerable sour mineral acidity and by tannins that have an aggressive sour sandalwood burr, and flow into a decidedly greenish finish. It's aggressive, in a decidedly underripe key that suggests heat problems in the vineyards, and is a wine that you should consider only if you like the style. If you do like this sort of brash aggressiveness, it will be good at a cookout or with fried meats and vegetables. Deeper black almandine with ruby reflections and white rim. The bouquet is muted, though swishing brings up some spice and alcohol. On the palate it's ample and quite soft, with moderate frankly generic berry fruit supported by minerality and peppery spice, and by tannins that are smooth and soft. It'ìs settled, and isn't going to perk up with time. Lively black cherry ruby with black reflections. the bouquet is muted, though swishing brings up some jammy cherry fruit supported by slight greenish spicy accents. But the shutters are closed. On the palate it's full, and soft, with ample greenish berry fruit supported by sour greenish sandalwood acidity, and by tannins that have a fierce peppery sandalwood burr and flow into a clean rather greenish cherry finish. The overall impression is fairly languid, in an almost slinky 20's moll style, and it will drink nicely with simple pasta dishes or light grilled meats and stews. It grew upon me. Lively black almandine with brilliant ruby reflections and pale ruby rim fading to pink. The bouquet is muted, and isn't letting anyone know what it's up to. On the palate it's ample and rather soft, with moderately intense sour berry fruit that has a dilute feel to it, supported by moderate acidity and by tannins that have a decidedly splintery burr and flow into a warm splintery finish. I'd have liked more richness to the fruit, and more unity to the tannins, which are quite aggressive. Because of its aggressiveness it will work well with fatty meats, but you have to like the style. Lively black almandine with ruby reflections and pink rim fading to white. The bouquet is still developing, but displays pleasant cherry fruit that is slightly jammy and has some greenish accents. Bright. On the palate it's full for a Bardolino, with ample red berry fruit supported by warmth and clean fairly smooth tannins that flow into a fairly quick finish. The fruit is pleasant, and when it all comes together, in a few months' time, it will be pleasant in a middle of the road key, and work well with quickly cooked meats or simple pasta dishes, especially those with red sauces. Lively almandine with black reflections and almandine rim. The bouquet is moderately intense, with berry fruit supported by tart berry fruit acidity and clean spice with some mentholated accents. On the palate it's medium bodied, with fairly bright dusky berry fruit supported by slightly greenish sandalwood acidity and tannins that have a slight greenish sandalwood burr and flow into a clean greenish finish. Pleasant, in a fairly direct and quite approachable key (it's nowhere near as brash as many), and will drink quite well with simple grilled meats or light stews, and also has the zest to work with fried meats and vegetables. A friendly wine, and fried lamb chops sound good. Lively youthful almandine ruby with zesty ruby reflections and almandine rim. The bouquet is muted, though swishing brings up some berry fruit mingled with wood smoke. On the palate it's very young, with moderate berry fruit supported by a peppery burr that is in part from petillance, and by decidedly bitter tannins that flow into a bitter finish. It's a bit up in the air, and I'm not sure how well it will fall. Lively black almandine with black reflections and ruby highlights, and a ruby pink rim. The bouquet is bright, with cherry fruit supported by some berry fruit acidity and slight jammy accents. Nice depth, though very young. On the palate it's soft, with moderately intense cherry fruit supported by slight acidity, and by tannins that manage to be both flighting and green, and flow into a bitter savory finish. It feels as if the vineyard took a great burst of heat in July. Lively pale ruby with brilliant ruby reflections and white rim. The bouquet is fairly rich, with sandalwood-laced cherry fruit supported by clean greenish accents. Still developing, but pleasant. On the palate it's bright, with lively sour cherry fruit supported by sour cherry acidity, and by tannins that are smooth and have a slight burr. Pleasant in a graceful, not too charged key, and will drink nicely with simple grilled meats -- burgers come to mind. Elegant burgers cooked over charcoal. Worth seeking out. Dusky black almandine with black reflections and almandine rim. The bouquet is brambly, with greenish accents mingled with sour cherry fruit and hints of barnyard tang as well. A bit more rustic than many. On the palate it's bright, with fairly lively cherry fruit supported by sour berry fruit acidity, and by tannins that are peppery and warm, while the overall mouthfeel is ample -- it's like a spreading wave, and is a bit of a surprise. It's more particular than many, and I found myself wanting better definition, and also less aggressiveness to the tannins, which do light a fire. It was likely heatstruck in July. Lively black almandine with ruby reflections and rim fading to pink and white. The bouquet is muted, though swishing brings up some floral accents mingled with sea salt and spice. On the palate it's ample and rather lax, with moderate fruit that is supported by some minerality, and by tannins that are decidedly splintery and flow into a splintery finish. I'd have liked greater richness of fruit. Lively almandine ruby with black reflections and almandine rim. The bouquet is moderately intense, with cherry fruit supported by greenish berry fruit acidity and hints of sandalwood. On the palate it's rather luscious, with bright cherry and forest berry fruit supported by graceful berry fruit acidity and smooth sweet tannins that flow into a clean fairly bright berry fruit finish. Pleasant, in a fairly light, deft key, and will drink nicely with simple grilled meats or light stews. Pale cherry ruby with brilliant ruby reflections and cherry rim. The bouquet is fresh, and cheeky, with fairly bright berry fruit supported by slightly brambly acidity and slight greenish accents, On the palate it's bright, with lively cherry fruit supported by sour berry fruit acidity, and by clean slightly greenish tannins that flow into a warm tannic finish. Pleasant, and rather graceful, and will drink quite nicely with grilled meats or light stews, and also has the zestiness necessary to work well with fried meats and vegetables. Refreshing. Lively black cherry ruby with black reflections and cherry rim. The bouquet is a bit in the air, with cherry fruit laced with some graphite shavings and clean spice. On the palate it's ample and rather soft, with moderately intense berry fruit supported by bitter accents and some berry fruit. It's not as rich on the palate as I might have hoped from the nose. Lively black cherry ruby with black reflections and cherry rim. The bouquet is bright, and slightly medicinal, with cherry fruit supported by bitterness and iodine with a degree of airiness as well. On the palate it's bright, with fairly rich cherry fruit supported by greenish berry fruit acidity and by tannins that are fairly smooth, though they do have a slight greenish burr that flows into a warm tannic finish. Pleasant in a rather zesty key, and will dink quite well with cookout foods and similar. Pale almandine with black reflections and ruby highlights, and pink rim. The bouquet is fairly rich, with jammy cherry fruit supported by some greenish sandalwood accents and spice. Welcoming in a cheeky way. On the palate it's ample and quite ripe, with jammy berry fruit supported by moderate acidity and smooth sweet tannins that flow into a clean fairly soft finish. Pleasant in a softer more fruit driven key, and if you like the style you will enjoy it. Even if you prefer more aggressive wines you will find things to think about. Lively black cherry ruby with black reflections and cherry rim. The bouquet is muted, of the shutters closed and nobody home variety. On the palate it's fairly bright, with moderately intense sour cherry fruit supported by greenish very bitter tannins that have an angry graphite shaving burr and flow into a clean bitter finish. It's quite green, and quite aggressive, and if you like the style, which lights a fire on the tongue, it will work well with fattier grilled meats, or with fried meats and vegetables. Lively black almandine with black reflections and white rim. The bouquet is muted, which can happen in a barrel sample. On the palate it's fairly rich, with bright berry fruit supported by clean sour cherry acidity and by smooth sweet tannins that flow into a clean bright berry fruit finish. Pleasant, and promises quite well; it will be graceful in a not too aggressive key, and given the brashness of many 2009 wines this is nice. Quite welcoming, and also versatile, a direct food wine that will contribute nicely to the table. Lively black almandine with black reflections and ruby highlights, and pink rim. The bouquet is moderately rich, with jam laced sour cherry fruit supported by some greenish sandalwood accents. On the palate it's rich, with lively cherry fruit supported by bright berry fruit acidity and by smooth sweet tannins that do have a slight greenish burr, and flow into a clean bright sandalwood laced berry fruit finish. Pleasant and will work quite well with hearty pasta dishes, risotti, and also simple grilled meats or light stews. In other words, versatile, and quite pleasant to drink. Deep black cherry ruby with black reflections and cherry rim. The bouquet is muted, thouygh swishing brings up some jammy berry fruit supported by spice. It need time to fully develop, however -- at least until June 2010.On the palate it's medium bodied, with moderately intense sour cherry fruit supported by sour berry fruit acidity and considerable warmth, as well as tannins that have a warm greenish burr and flow into a clean tannic finish. Direct and up front, and wine that will work well with foods, ranging from risotti and pasta dishes through simple grilled meats and stews, supporting what it's served with rather than demanding the limelight. There is a place for these wines, and there can never be enough of them. Lively almandine with ruby reflections and rim that pales to pink. The bouquet is fairly rich, with berry fruit that has some sweetish accents and slight candied notes. On the palate it's fresh, with fairly rich cherry fruit supported by warm berry fruit acidity and by smooth sweet tannins that do have some sandalwood to them, and flow into lasting warmth. Pleasant, in a warm graceful key, and though it won't work if you want the smooth softness of a Merlot, it is pleasant, and will work very well with all sorts of things, from risotto through meat based pasta sauces and on to simple grilled meats. Expect the bottle to go quickly. Bright black cherry ruby with black reflections, ruby highlights, and white rim. The bouquet is moderately intense, with cherry and forest berry fruit supported by clean berry fruit acidity with some greenish accents. On the palate it's medium bodied, with farly rich greenish cherry fruit supported by lively mineral citric acidity, and by tannins that are warm and have a sandalwood underpinning, and flow into a clean warm finish. It's pleasant in a rather cheeky slightly aggressive key, and will drink nicely with grilled meats or light stews, and also with fried meats or vegetables. Pale cherry ruby with brilliant ruby reflections and white rim. The bouquet is muted, though swishing brings up some berry fruit but not much else. On the palate it's ample and soft, with moderately intense sour cherry fruit supported by some citric acidity, and by smooth tannins that have a slight greenish burr to them, and flow into a clean slightly greenish finish. I'd have liked more zest to the wine, which is a bit settled, and with fruit that isn't as bright or as intense as it might have been. Dusky black almandine with shadowy ruby reflections and rim that pales to white. The bouquet is moderately intense, with cherry fruit supported by some greenish spice. On the palate it's medium bodied, with moderately intense berry fruit supported by rather evanescent acidity, and soft tannins that flow into a soft finish. It's smooth, but lacking in richness, and I'd have liked more brightness to the fruit. Lively black cherry with black highlights, ruby reflections and cherry rim. The bouquet is delicate, with red berry fruit mingled with some greenish accents and alcoholic warmth. On the palate it's medium bodied, with moderately rich berry fruit supported by slightly greenish acidity and smooth sweet tannins that flow into a clean fairly bright bitter berry fruit finish. It's fairly direct, and will drink well with simple grilled meats or light stews, doing a nice job of supporting what it's served with. Lively almandine with brilliant electric ruby reflections and black rim. The bouquet is muted, though swishing brings up some berry fruit with brambly acidity and greenish accents with some underlying spice. On the palate it's medium bodied and soft, with moderately intense sour cherry fruit supported by sandalwood acidity and smooth tannins that do have a peppery burr, and flow into a fairly long warm berry fruit finish. Direct, and fairly simple, it will do a nice job of supporting what it's served with, without hogging the limelight, and this is what the vast majority of wine is all about. Pale ruby with black reflections and cherry rim. The bouquet is muted, though swishing brings up sour cherry fruit supported by slight greenish accents and spice. It's still developing. On the palate it's quite soft on the outset, with fairly rich, fairly bright sour cherry fruit supported by greenish berry fruit acidity and smooth tannins that have a peppery burr, while the acidity becomes progressively warmer as the fruit fades. It's direct, and up front, and will drink well with hearty risotti, red sauced pasta dishes, and simple grilled or stewed meats, while the acidity is such that it will work well with fried meats and vegetables too,. In short, versatile. Pale ruby with ruby reflections and white rim with hints of orange overtones it. The bouquet is moderately intense, with cherry and forest berry fruit supported by some spice and acidity with vinous overtones. On the palate it's ample, with fairly rich cherry fruit supported by smooth berry fruit acidity and smooth sweet tannins that flow into a clean bright berry fruit finish with a slightly splintery tannic underpinning. It's up front, and quite direct in a brash acidic but not too aggressive key, and will drink quite well with foods, ranging from risotto through red-sauced pasta dishes and up to simple cooked meats. Versatile, and will go quickly. You may want a second bottle. Lively black cherry ruby with black reflections and cherry rim. The bouquet is moderately intense, with some sour cherry fruit supported by moderate brambly acidity and greenish spice. On the palate it's bright, with lively sour cherry fruit supported by brisk sour cherry acidity and by tannins that have a splintery green burr and flow into a clean peppery finish with considerable sour berry fruit underpinning. It's aggressive in a cheeky teenaged sort of way, and will drink well with grilled meats fried foods, and such, In other words, summer meats. If you like smoother softer wines it won't work as well for you, but if you like brasher more aggressive wines it is appealing. Pale almandine ruby with black highlights, ruby reflections, and white rim. The bouquet is moderately intense, with red berry fruit mingled with spice and some brambly accents. On the palate it's maple and soft, with fairly bright sour cherry fruit supported by moderate sour berry fruit acidity, and by smooth sweet tannins that flow into a warm fairly tart finish. It's less aggressive than some, because the tannins lack that angry burr, but is lively, with considerable acidity, and will drink well with grilled meats or light stews, and also has the acidity necessary for fried foods. Versatile in a slightly less aggressive key than some, and I found myself warming to it. Pale almandine ruby with lively ruby reflections and white rim. The bouquet is fairly rich, with sour cherry fruit supported by bright berry fruit acidity and by some pleasant greenish accents. On the palate it's ample, and fairly sweet, with jammy berry fruit that has some hints of cranberry jelly supported by bright berry fruit acidity and by smooth sweet tannins that flow into a clean bright berry fruit finish. Pleasant, and quite approachable in a fairly seductive key; though it is brash with considerable acidity there is a curviness to it as well, and it will work nicely with grilled meats, or fried foods -- lamb chops, but also chicken -- and as such is a perfect summer wine. If you like this rather brash style you will enjoy it. Lively cherry ruby with black reflections and white rim. The bouquet is moderately intense, with greenish brambly accents and sour berry fruit mingled with some spice. On the palate it's ample and rather soft, with moderately intense greenish cherry fruit supported by moderate acidity and smooth sweet rather languid tannins that flow into a clean sour berry fruit finish. Lively black almandine with black reflections and cherry rim. The bouquet is fresh and vinous with some cherry fruit underpinning and slight spice. On the palate it's medium bodied, with rich cherry fruit supported by sour cherry acidity that's quite clean and quite bright, while the tannins are smooth and flow into a clean sour cherry fruit finish. Graceful, in a lithe key, and will drink very nicely with foods, especially summer favorites such as mixed grilled or fried meats. Worth seeking out. Lively garnet ruby with dusky ruby reflections. The bouquet is eye opening, with peach skin and berry fruit aromas whose combination somehow brings a chinato wine to mind, with some hints of brown sugar as well. Completely unexpected from a Bardolino, and there's also a fair amount of alcohol. On the palate it's ample and rather sweet, with very little fruit -- sweetness, and slightly greenish tannic notes that flow into a soft finish. Something must have happened in the cellars, because it differs from all the other wines poured, and lacks the careless freshness that is a hallmark of Bardolino. Lively black almandine with dusky ruby reflections and white rim. The bouquet is bright, with greenish vegetal accents mingled with berry fruit and spice, but not much fruit. On the palate it's medium bodied, with rich cherry fruit supported by graceful sour cherry acidity, and by smooth sweet tannins that flow into a clean sour cherry finish with some tannic underpinning and pleasant acidity. Graceful, and will drink nicely with a wide variety of foods, from risotti though grilled and fried meats. Expect it to go quickly, and you may want a second bottle. Deep black almandine with fait ruby reflections, considerable black highlights, and ruby rim. It's quite dark for a Bardolino. The bouquet is developing; there is some fruit, and hints of something chemical -- not quite white glue but in that direction -- and some savory accents as well. Needs a few months. On the palate it's ample and soft, with moderately intense cherry plum fruit supported by warmth and smooth sweet tannins that flow from underneath the surface to provide direction, and lead into a finish that becomes quite warm. It's not what I expect of a Bardolino, which should be lithe and nimble. This is much more settled, and gives an impression of trying to be bigger than it should be. Pale almandine ruby with lively ruby reflections and white rim. The bouquet is bright, with greenish mentholated berry fruit supported by some sour berry fruit acidity and by savory accents, with slight sandalwood as well. On the palate it's medium bodied, and decidedly zestier than I expected, with moderately rich berry fruit supported by a strong peppery burr that comes from slight petiallnce and flow into a clean berry fruit finish. This sort of burr is a bit rustic, and is something that was more common in the past. This said, though it is a negative in terms of the evaluation of a still wine, the wine will drink well with succulent grilled meats or other foods that beg something to clean the palate between bites. Pale almandine ruby with brilliant reflections, black highlights, and white rim. The bouquet is fairly intense, and rather greenish, with red berry fruit supported by greenish accents, some sandalwood, and airy spice. On the palate it's ample, and fairly sweet, with moderately intense cherry fruit supported by moderate acidity and smooth sweet tannins that flow into a fairly long warm berry fruit finish. It's approachable in a riper, richer key than many, and if you like wines that have more fruit and less brashness you may prefer it, though it remains very much a Bardolino. Deep black almandine with lively ruby reflections and almandine rim. The bouquet is fairly intense, and vinous, with some greenish brambly accents as well, and some green leather, which is a bit unusual for Bardolino. Not much fruit. On the palate it's ample and smooth, with moderate berry fruit that's frankly generic supported by citric acidity that becomes rather warm, and by ample smooth sweet tannins that work from below the surface. It gives an impression of trying to be bigger and more important than it is. And this isn't really what Bardolino is all about. Lively black almandine with black reflections and almandine rim. The bouquet is is bright, with rich cherry plum fruit supported by some berry fruit acidity, and by greenish menthpated accents, with underlying jammy sweetness as well. On the palate it's ample and sweet, with bright sour cherry plum fruit supported by deft berry fruit acidity and by smooth sweet tannins that flow into a decidedly warm finish. Pleasant in a more fruit driven and less brash key; though there is the aggressiveness of the acidity, which lasts and lasts, the tannins are not angry, and this is certainly positive. It remains very much a Bardolino, but is more approachable than some, and offers a nice introduction to the genre. Lively ruby with brilliant ruby reflections and cherry ruby rim paling to white. The bouquet is fairly rich, with slightly balsamic berry fruit supported by spice and savory accents. On the palate it's medium bodied, with rich cherry fruit supported by deft berry fruit acidity and smooth sweet tannins that flow into a clean fairly bright cherry finish. It's quite approachable, displaying considerable polish, and will drink nicely with simple grilled meats or light stews, and also with risotti or pasta dishes. By comparison with many of the other Bardolini presented it is considerably less aggressive, and as such it is much more approachable, and offers a good introduction to the wine if you have never tried it.